Kodi Smit-McPhee and Chloë Grace Moretz in Matt Reeves’ “Let Me In.” Courtesy of Overture Films. Interesting how two of this summer’s most entertaining and expertly crafted blockbusters are ultimately about the same thing. Dean DuBlois’ “How to Train Your Dragon 2” and Matt Reeves’ “Dawn of the Planet of the Apes” both ask whether humans can coexist on earth with an animal that has the potential to devour them. The first “Dragon” picture already answered this question (yes, naturally), as its sensitive protagonist, Hiccup (voiced by Jay Baruchel, sounding more than ever like a young Wallace Shawn), demonstrates to his fellow Vikings that the fearsome fire-breathers can be befriended and domesticated as long as they are treated with respect. The single most touching image of the franchise (witnessed in both films) shows Hiccup reaching out to Toothless, his cherished dragon, who studies the boy’s hand before nuzzling against it like a towering puppy dog. “Dawn of the Apes” (a better abbreviated title much like “Dragons 2,” which DuBlois’ film is called in France and Canada) has a more pessimistic answer (no, naturally), illustrating like its predecessor that the peaceful efforts of a few good creatures are no match for the inevitability of war. Motion capture’s finest subject, Andy Serkis, delivers some of his most complex work to date as Caesar, the ape who leads a simian rebellion against all human captors only to discover that his foes are not all that different from his own kind. The hate-fueled deceit and brutality displayed by man and ape are paralleled to such a degree that they are rendered indistinguishable from one another. The film is bookended by extraordinary close-ups of Caesar’s eyes, which exude fierce determination at the beginning and crestfallen resignation at the end. It may be the saddest summertime thriller in recent years. The message of “Dragons” and “Apes” is clear: treat other species with respect or face the irreparable consequences. Yet what if the survival of the species in question requires your own extinction? That troubling question was posed by Reeves’ previous feature effort, “Let Me In,” which opened to little fanfare and crippling indifference in 2010, causing it to be dismissed as dead on arrival. Many cinephiles were adamantly against the very notion of Hollywood remaking Tomas Alfredson’s original 2008 Swedish gem, “Let the Right One In,” and didn’t bother giving this new one a shot. That’s entirely their loss, considering that Reeves’ remake remains one of the most criminally under-appreciated films of the last decade, not to mention one of the only modern American horror movies that grapples with the inherent tragedy of vampirism. At its core are two sublime, wondrously unaffected performances by Kodi Smit-McPhee and Chloë Grace Moretz as two old souls in young bodies, gravitating toward each other in order to dispel the loneliness that threatens to suffocate them both. If only it were that simple. It’s clear from the get-go that Abby (Moretz) is not your average 12-year-old. She walks barefoot in the snow, is followed everywhere by a grim, decidedly unfatherly figure (Richard Jenkins), and has a tendency to emit streams of blood if she’s not properly invited into a room (one may recall Lena Dunham’s college graduate in “Tiny Furniture” being told that she can’t reenter her parents’ house unless she’s “invited in,” to which Dunham quips, “Like a vampire?”). Yes, Abby is indeed a vampire, yet not the sort of brooding love interest so grotesquely romanticized in the insufferable “Twilight” franchise. Moretz is so uncannily convincing as a pint-sized adult that you believe her when she says, “I’ve been 12 for a very long time.” With subtle nuance, she conveys the sadness of a life lived at the expense of others, exploiting the kindness of strangers in order to acquire their blood. She may feel genuine affection for Owen (Smit-McPhee), the alienated boy next door who has developed a crush on her, but that doesn’t mean she isn’t using him too. Consider how Abby encourages the meek and timid Owen to stand up for himself and fight the bullies who terrorize him rather than turn the other cheek. This is more than just friendly advice. She’s purposefully molding him into the bold and resourceful aggressor he must become in order to take the place of her ailing adult caretaker, thus spending the rest of his years as an outlaw from society. Many have come before him and many will follow in his doomed footsteps, walking the earth as spectral phantoms made flesh, living only to murder for their undead love. Choosing a life with Abby is akin to choosing death itself, yet what choice does Owen have? Ignored at home and despised at school, the kid is desperate to find attention and acceptance, even if it means losing himself in the process. He’s in the grand tradition of tragic antiheroes like Stephen King’s Carrie, whose story is mirrored in Reeves’ climactic bloodbath, a sequence evocative of the horrifying violence that has pervaded many a classroom in recent years. 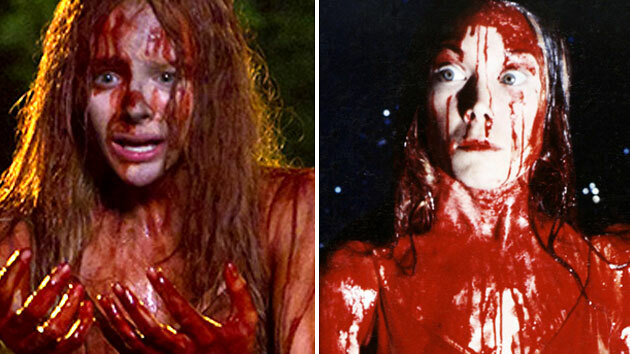 Though Moretz faltered in Kimberly Peirce’s ill-advised 2013 remake of “Carrie,” proving too poised and self-assured to be credibly vulnerable, Smit-McPhee channels Sissy Spacek’s iconic portrayal of agonized youth with astonishing intensity. To see him is to pity him. Like Bella Swan, Owen sacrifices his very identity in the name of love, but unlike in “Twilight,” this does not result in his self-actualization, but rather, his imprisonment. The “Dragons” and “Apes” pictures preach the importance of understanding and engaging in your environment rather than demonizing it. “Let Me In” is a cautionary ode to those who choose to disengage from life entirely, opting instead to remain trapped in a cycle of self-destruction. I honestly can’t think of a more poignant metaphor for an unhealthy relationship that drains your life away the more you cling to it. Owen has fallen under Abby’s spell so completely that he lets her in at the precise moment he should shut her out. She’s trained him well.